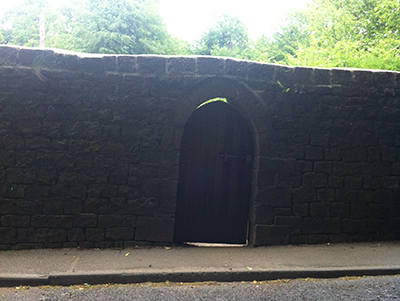 Theo discovered a secret door on his walk today. We were driving down a lane in a local town, looking for somewhere to walk and couldn’t resist seeing what was on the other side. Built as a palace by the Archbishops of Canterbury, gifted to Henry VIII, remodelled by the Sackville family, Knole is one of England’s most important and complete historic houses and the National Trust is committed to its survival. 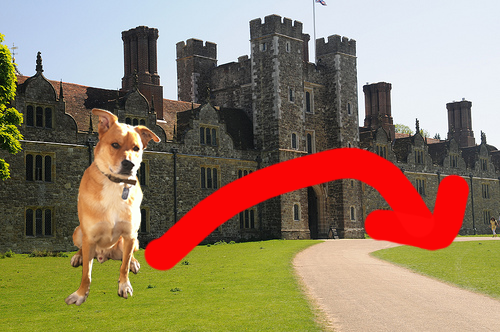 I’ve used my new photoshop skills to illustrate the exact spot that Theo made his deposit. Ahem. That looks like such a beautiful place to visit! And yep, Knole Park is great – I’d recommend it if you visit Kent sometime. We’re lucky, there are loads of National trust woods and parks near us, all great for walkies and squirrel-hunting.